Food Adventures of a Comfort Cook: Yo Chicago, pass me a pizza. Yo Chicago, pass me a pizza. In my January 21, 2011 post, I introduced you all to New York style pizza. I had said I would, at a later date, write about Chicago style and here it is. 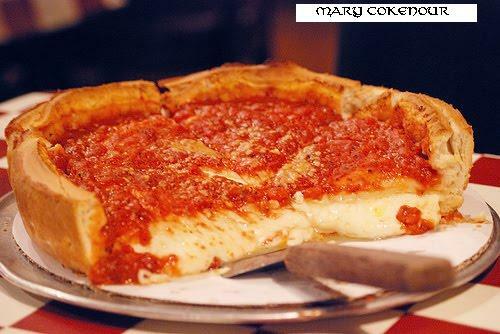 Chicago Pizza is a deep dish pan pizza, but not what you think you know it is. The dough is made differently from regular pizza dough; thicker and moister to keep from drying out and burning during baking. The assembly of the pizza itself is also different, with the cheese on the bottom, additional ingredients in the center, and a tomato mixture on top. Pizza places, like Pizza Hut and Old Chicago, use basic dough and the assembly is the same as a standard pizza: dough, sauce, cheese, toppings (if any). If you want the authentic Chicago style, then you want to go to Pizzeria Uno (http://www.unos.com/) or Lou Malnati’s (http://www.loumalnatis.com/). No locations near your area, Lou Malnati makes it possible to order online and have pizza, and many other goodies, delivered to your front door (http://www.tastesofchicago.com/). Then again, my sister-in-law, Julie, is currently living in Chicago; and it would be so nice if she’d send us a few pies…hint, hint Julie; Roy and I are having cravings for pizza. Now if you’re a daring type, like me, then you’ll take on the challenge of making this type of pizza yourself. Because the dough is thicker and moister than regular pizza dough, it’s best to use a stand mixer and a dough hook attachment for the kneading part of the preparation. This type of pizza dough is thicker; it cooks in a deep dish pan and would burn if it was thinner like New York style pizza dough. However, the exposed dough, not covered with sauce, cheese and other ingredients, comes out crispy and light. This dough is best made using a stand mixer and the dough hook attachment due to the thickness and moistness of the dough. In the bowl of a stand mixer, dissolve the yeast in the warm water. When fully dissolved, add in the oils, cornmeal and half of the flour; mix for 10 minutes. Attach the dough hook, add in the other half of the flour and set on medium speed. The dough will be ready when it pulls easily from the sides of the bowl. Place the dough onto a floured board, cover with a large bowl; let it rise till it doubles in size. Punch the dough down, cover; let it rise again. Punch it down a second time; time to make the pizza. The thickness of the dough will depend on the size of the deep dish pan being used; ¼” for a 10” pan; 1/8” for a 15” pan. Lightly coat the pan with olive oil; place dough in center of pan and push out evenly to edges, then up the sides of the pan to the top rim. AssemblyCover the dough with alternating slices of provolone and mozzarella cheeses. In a medium size bowl, mix together crushed and diced tomatoes, herbs, garlic and salt; spread mixture evenly over cheese slices. Sprinkle grated cheese evenly over tomato mixture. The pizza will be baked in a preheated 475F oven for 35-40 minutes; the exposed crust will be a golden brown; the tomato mixture will be bubbly. These can be added on top of the cheese slices, before the tomato mixture goes on top; in any combination; the choices are numerous. 1 lb of ground Italian sausage (mild or hot) or seasoned ground beef – the meat is uncooked; cooking the meat before using will toughen it. I tried making a Chicago style pizza at home using shredded mozzarella. What a disappointment. The cheese baked into the bread-I had no idea slices of cheese would work better than shredded and give the cheesy texture of a well-made pizza. Thanks for sharing this recipe. I'm on my second attempt at baking the pizza-this time with pizza dough from Publix. On my next attempt, I'll use your recipe for the pizza! I am so sad that the only Pizzeria Uno anywhere near us closed its doors. Now we'd have to drive 4 hours just to get pizza from Giordano's in Orlando.